Plaster, paint, wood, and metal, 96 x 69 x 52 in. George Segal was an American painter and sculptor known for sculptural explorations of the human form interacting with surrounding environments. Beginning his career as a figurative, expressionist painter, Segal soon transitioned to figurative sculpture. He pioneered a new technique, creating life-sized sculptures from plaster—using his family and friends as living molds—often setting figures in tableaux with found objects. 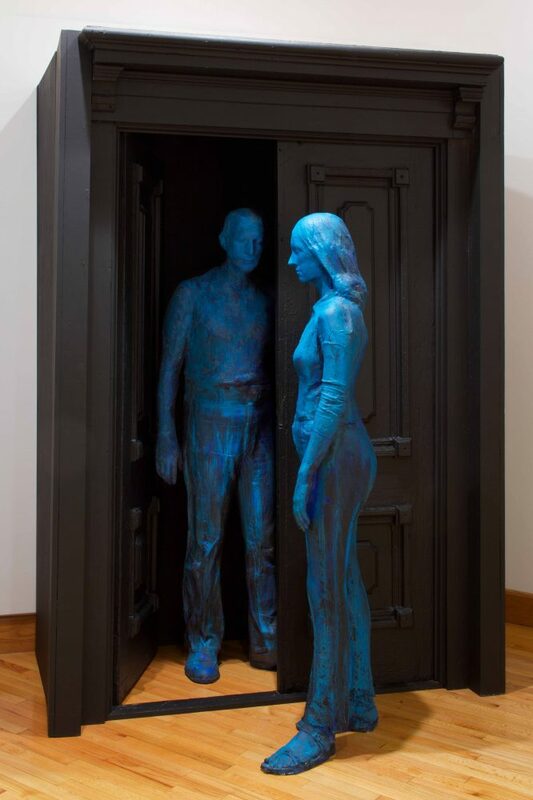 Couple in Open Doorway is a quintessential example of Segal’s sculptural tableaux at a moment in the mid-1970s when he was returning to the use of color after over a decade of creating purely white figures. Blue paint is applied over the plaster, evoking Segal’s roots as a painter and colorist. Two figures stand in the doorway facing each other within the real physical space of the gallery. They do not face each other, their eyes are closed, and their body language is affectless. This emotional ambiguity is underscored by the chilly and complex quality of the figures’ blue color. The doorframe, containing one figure but not the other, contributes to the simultaneous feeling of togetherness and alienation. This is doubly striking in large part because the figures occupy the real space of the viewer, heightening its affective immediacy. Couple in Open Doorway was a major gift from the George and Helen Segal Foundation and adds to WCMA’s existing holdings of Segal’s prints and mixed media work. It is also a significant contribution to the museum’s collection of twentieth-century sculpture.